This photo was a test shot with my new iPhone right after Thanksgiving to send my sister-n-law. My brother had just taken out the wall between their kitchen and dinning room and they were adjusting to noise bouncing around the newly open space. I sent this to her so she could get a sense of our open space. With our kids home for the holiday we had a lot of noise bouncing around and up and down! With the holiday behind us we are back into renovation mode. It’s hard to fathom that we are not actually done yet. We came upon a huge obstacle this past fall that forced us to come to a screeching halt. We were caught in a bureaucratic snare that was by far the most frustrating part of this journey. The situation was very emotionally charged for me and I could not write about our plight with objectivity until now. It is a very long story. I will hit the highlights. In late April, 2014 we approached the city about the utility pole in the alley blocking the entrance to the old garage. We wanted to remove the dilapidated, cinderblock garage and replace it with an open carport but the pole obstructed the entrance. The simplest solution for city officials at the time was to grant us entrance to the carport from the side street instead of the alley. New curb cuts on city streets are very limited and a cherished commodity, though granted by code to corner homes that border an alley; a fact that I was unaware of until John and I met with the city to ask about moving the utility pole that apparently belongs to Verizon, not the city. We were surprised but thrilled and set about removing the old garage and making the changes to install a driveway and a parking pad with underground piers for the carport. That work took place during an oppressive heat wave in June. July and August were slow months as we needed to catch our financial breath and John took a much needed hiatus from daily work at Honor’s Corner. Our adult kids were in and out and we used the time to get acquainted with the house and settle into the neighborhood. 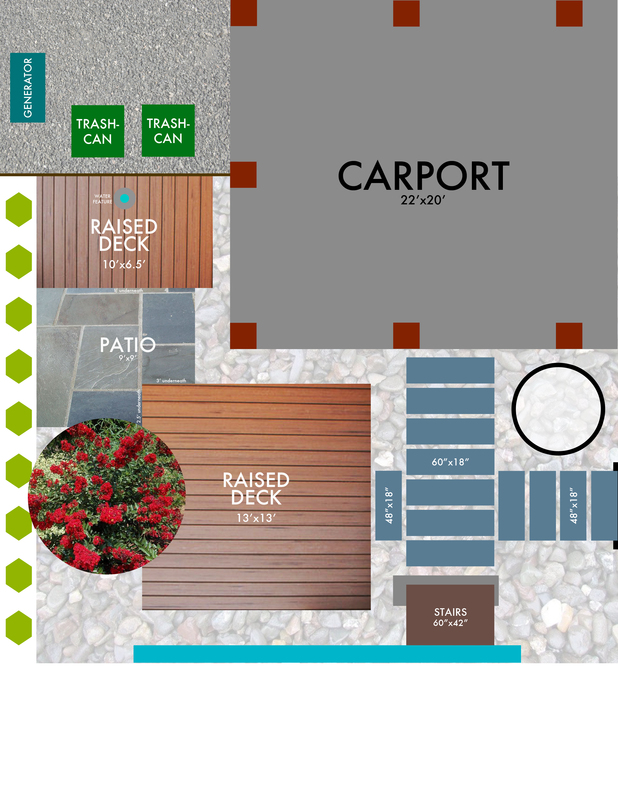 When September rolled around we focused our attention to the final stage: the carport and the backyard landscaping. We hired a draftsman to produce the professional renderings for the carport and took them to the city to obtain the building permit. Back in April we had discussed the plans with the permit office representative but only had hand-sketched ideas so we were not able to file for the carport building permit at that time. In October I took the plans to the city. A week or so later I received a call requesting that I meet with the zoning office about the plans. John went with me. We were informed that the driveway width and carport placement were out of compliance for the Museum District. This is where the snare begins. Because we are a corner lot and abut an alley we are allowed a 9-foot (one-car) driveway. We were permitted and had installed a twenty-two foot (two-car) driveway. Additionally, because our side street has homes that face that street, our carport could not stand in the plane of those front yards. Meaning, our carport could not be relocated to the side of the yard where the driveway and concrete pad, with several under ground concrete piers, had been installed. Because there was already a two-car driveway and garage directly across the side street from us, the city had allowed us to mirror the design; to keep with the neighborhood aesthetic. These details were discussed back in April during our application for the original permit. Apparently there had been some changes to design ordinances for Museum District several years ago that were not verified before our permit was issued. John and I sat across the table from a very sweet, frustrated, helpless zoning representative that could only tell us that we were out of compliance and could go no further into our project. She didn’t know if we would be forced to tear it all out, use it as it was or wait for the city to come remove the permitted structures. I fought back tears and John fought back screams and fist slamming. It wasn’t her fault. It was someone’s fault that we had been given the permit and spent several thousand dollars in preparations to get to this point. Assigning blame was irrelevant. We just needed a solution. The solution came from weeks of meetings with every level of the Zoning and Planning Commission and our city councilman. In the end, the only entity that could rectify our predicament was city council. We had to be granted a special use permit to place the carport on the east side of the yard and to have a two-car driveway. Neither of these are uncommon in our neighborhood, just out of compliance with the most recent ordinances. Obtaining a special use permit requires that the home owner complete extensive paperwork and post a large sign on their property notifying neighbors of the request. The paperwork is sent to city council for review at their monthly meeting. Along the way the paperwork and plans are reviewed by design committees and neighborhood associations for required endorsements. 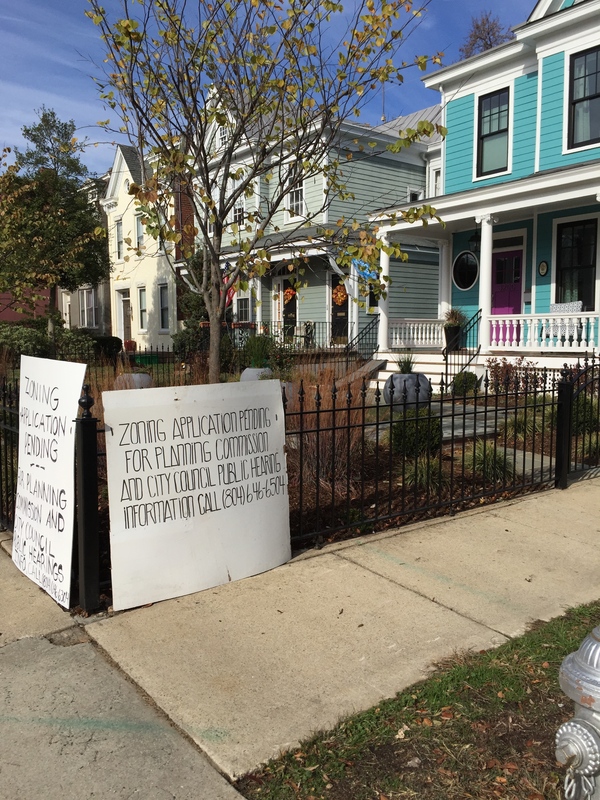 Once reviewed by city council, Z&P sends a letter to neighbors within 150 feet of the property line on all sides and a public hearing is held. The results of the public hearing are then presented to city council again for a final vote of approval. It took just over two months for the process to play out. From what we have learned, two months is lightening speed! We are so very grateful to the Z&P official assigned to our case and our city councilman for helping us navigate the process and expediting the paperwork. Because we face two streets, we technically have two front yards and thus were required to post two signs. A neighbor, who was granted a special use permit by city council the month prior, gave us his sign and we made the additional one ourselves. There are positives to be found through most unpleasant situations and ours is no exception. We talked to dozens of neighbors and made some new friends! We became acquainted with our city councilman, Jon Balilies, son of Virginia Governor Gerald Balilies who served the state from 1986-1990. He actually lives on our street but I had never met him and hesitated to reach out to him. That was silly, I found him to be a down-to-earth, no nonsense, genuine person who works tirelessly for our district. It was fun and interesting to see some of the intricacies of city government. We attended our first city council meeting, figured out the best places to park around City Hall and gained a appreciation for governmental procedures. I was forced to develop some more patience, which is always a good thing! On December 8th our special use permit was approved by city council! We are now waiting for the brick mason to build the columns and then John and Patrick will build the carport. Once it is in place, the landscape work con be done and the fence can be installed. We have been asked to participate in the Museum District Mother’s Day House tour so we are aiming for 100% completion by May, exactly two years from the first hammer of demolition! Mallory was instrumental in developing a landscape plan for the backyard and putting it on paper. The white ring is for flowers and there will be grasses dispersed among the rocks and a planting area under the tree. We are pretty excited about having a low maintenance entertaining area that provides drainage for rain water to stay on our property. The yard looks a lot bigger in this diagram than it actually is. It will be fun to post the pictures after installation!